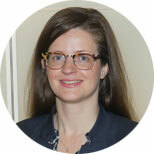 Katrin Burkart, PhD, is an Assistant Professor of Health Metrics Sciences at the Institute for Health Metrics and Evaluation (IHME) at the University of Washington. In this role, she works on the Global Burden of Disease (GBD) project, conducting research on environmental risks and methods to include exposure to suboptimal temperature. Dr. Burkart is also working on projections of future temperature-related mortality under climate and population change scenarios. In addition to accounting for rising temperatures, she is particularly interested in incorporating the dynamics of global change, especially demographic and epidemiological change as well as urbanization into her estimations and projections. Before coming to the University of Washington, Dr. Burkart was a Postdoctoral Research Scientist in the Department of Environmental Health Sciences at the Mailman School of Public Health at Columbia University in New York. Dr. Burkart received her doctorate from the Humboldt Universität zu Berlin, Germany, where she conducted research on the short- and long-term impacts of temperature and thermal conditions on human mortality in Bangladesh. She is particularly interested in understanding how temperature impacts are modified by regional, spatial, or population-specific characteristics. Dr. Burkart has published several papers on effect modifications by demographic characteristics, such as age and socioeconomic status, as well as intra-urban and urban-rural differences. In recent studies, she highlighted interactive effects between air pollution and high temperatures and pointed at the role of urban vegetation in heat effect mitigation.